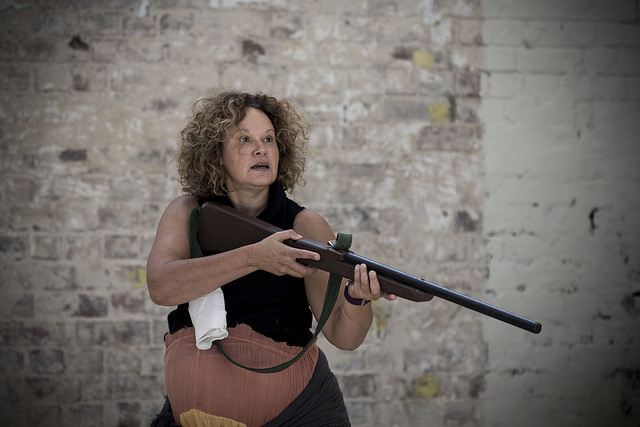 Belvoir in association with Oombarra productions present THE DROVER'S WIFE, by Leah Purcell, in the Upstairs Theatre, in the Belvoir St Theatre. 21 September - 16 October. THE DROVER'S WIFE by Leah Purcell, is a new Australian play. Henry Lawson's short story, THE DROVER'S WIFE, was a reading that most of us of a certain generation had at school. Ms Purcell in her program notes tells us that it was a part of her growing up, a personal and familiar story shared with her by her mother, regularly, such that at the last line: I would stop her and say. "Mother, I won't ever go a drovin". The Bulletin magazine had sent Lawson out west to see country Australia and in July, 1892, published this story. It told the urban readers of the real circumstances of country life - it is a stark, fearsome and bleak observation. This was when the magazine had set up the famous Bulletin Debate, and pitched the romantic Australian poet 'Banjo' Patterson against the realistic, poetic writings of Henry Lawson. Where Patterson extolled and romanticised the heroism of the country and its denizens, Lawson told of the other difficult realistic side. It was a revelation and one which gave respect to those pioneers without that romantic 'jingoism' wrapped about it. (There was no winner to the Debate, but it is interesting that Patterson replaced Lawson on the back of the Australian ten dollar note - and more interesting (ironic) that Mary Gilmore, who rejected the marriage offers of Lawson, is on the other side!). What Ms Purcell has done is to appropriate this iconic title and write her own story with a specific 'political' intention in mind. She uses a quote from Henry Lawson, himself, to introduce her play:"It is quite time that our children were taught a little more about their country for shame's sake." Ms Purcell sets her play in 1893 ... Alpine country, southern New South Wales. It is she says: "An Australian western for the stage." The play in some 100 minutes packs in a horrific sequence of events, with a literary necessity of a poetic licence with time, that reveals a more stark, fiercer and bleaker but absolutely real version of life in the outback of colonial Australia than even Henry Lawson observed. Taking Alfred Hitchcock's quote (paraphrased) "That drama (film, theatre) is life with all the boring bits taken out." Ms Purcell, inspired, she said by the HBO series DEADWOOD and the Quentin Tarantino DJANGO UNCHAINED, and 'the history of her grandfather's personal papers and the recorded history that was documented by people of authority at this time', has put a highly improbable speedily successive set of cataclysms of event on stage, that are compacted over a three day spacing in her storytelling, covering revelations of shock that resonate as truths that we have all 'known' of (suspected) but never spoken of, (at least on stage), that further illustrate many of the current dilemmas of trauma for our indigenous brothers and sisters. In one of my earlier drafts, I wasn't happy with the ending and my partner said, 'If we blackfellas can't tell the truth of our history, then who can?' This opened the floodgates, and I wrote like I was riding a wild brumby in the Alpine country, and no apology for the rough ride. The story events in this play are indeed, for some, a confronting experience and accumulatively could be hard to watch, to look at, but, it is vital stuff and vital writing. If you felt that THE SECRET RIVER was a ground breaking and culturally maturing flowering, check THE DROVER'S WIFE out (it is of a more modest production value, but content wise is expansive). We have, of course, had this kind of story given to us in such film's as Rolf de Heer's THE TRACKER (2002), and even more fiercely in THE PROPOSITION (2005), a film by John Hillcoat (Ms Purcell had a small role in that), but they were, generally, under appreciated, even, perhaps, ignored. 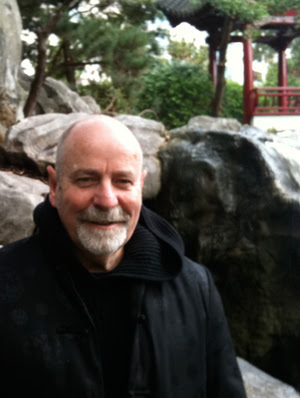 Rohan Wilson has written two terrifying novels: THE ROVING PARTY (2011), and TO NAME THOSE LOST (2014), which reveals scarifying events of our collective history. It is the content that is vital and the successful part of the writing in THE DROVER'S WIFE (some of the prose/poetry, as well), for the structure itself has a timeline and set of coincidences, that could stretch incredulity into a possible disengagement with the experience. It is, perhaps, then, the raw shock of the play's truths, combined with the Direction of Leticia Caceres that, mostly, covers those insecurities, and keeps one attentive, for she guides this 100 minutes, without interval, with the same sureness for suspense that she revealed last year with MORTIDO (although, the Sound Composition, Design, by THE SWEATS, sometimes overstates its presence - why did I keep thinking of Nick Cave's work in THE PROPOSITION?). Here, Ms Caceres' has invited Stephen Curtis to Design the Set and Tess Schofield, the costume, both having created the visuals for THE SECRET RIVER so successfully. I found the costuming brilliant, whilst the setting itself did not seem to tell me of an Alpine setting but rather that of a Drysdale outback painting of dust and dry. Lighting by Verity Hampson does much to propel the tensions (gothic?) elements of the story plotting. Mark Coles Smith, as Yadaka (he was the leading support actor in LAST CAB TO DARWIN), grounds his performance work with a truthfulness and dignity, gravity - imbued with a necessarily muted charisma. Benedict Hardie creates a trio of characters with frightening conviction, each uniquely defined and memorable - arresting work. Too, Tony Cogin with a duo of ugly men, strikes uncompromising menace and 'evil' for us. Will McDonald, as the young son, Danny, has the physical dynamic to have us give him empathy, although, his work, sometimes, sits superficially as 'reported' work rather than experienced truth. This is, for me, a problem with Ms Purcell's work as well. Her performance is adequate in that it signals with all the right semaphoring of the body and voice, the journey, but lacks authentic experiential, in-the-moment belief. It is all indicated not 'lived'. It is 'acted' and not 'happening'. For instance, the pregnancy, the aftermath, was not consistently believable and a great deal of the physical life was not sustained or marked for empathetic endowing. Brusque, efficient, clean, sometimes rushed - the Scene Four story of the killing of the bulllock, unintelligible recitation, no thoughts. It seemed the writer has more courage than the actor, at least at this performance. The climatic solilioquy of Scene Eight finishing in a protracted 'wailing' was embraced as opportunity for an actor, rather than as revelation of a character's journey. Demonstrated with not much authentic, organic motivation. I wished that the Drover's Wife had had some of the courage of conviction that the antagonist played by Jennifer Jason Leigh in Tarantino's other, more recent Western: THE HATEFUL EIGHT had. Such was my imagination alienated, that I wondered whether a younger actor, too, would have made more sense of the story - to the pregnancy, the swift 'recovery', the growing physical and emotional attraction to the young indigenous intruder. I guess it is hard to hand over a role that one has written, especially such a great one - but the age, for me, was a distraction and was slightly discomforting in the developing relationships in the play. Still, I am out-of-step with others on this and it ought not discourage you from the experience of the production. THE DROVER'S WIFE, is an important piece of writing. Harrowing. Timely. There is more to put onstage for 'debate' and exposure, as Warren Mundine has made clear in his call for action on Community violence, today, in instance in Alice Springs.THE DROVER'S WIFE is a demonstration of the power of Art. Kevin, can you please clarify your statements concerning the age of Leah Purcell? Are you suggesting that a 46 year old actress is incapable of relating to the physical duress of labour and miscarriage? Or of the experience of feeling sexual attraction to a stranger? Wondering what argument and evidence supports your opinion around the age of the performer. I hope I have misinterpreted your comment, and that you aren't reinforcing double standards in our industry concerning gender and age. No not at all. I have no double standard about casting in age and gender and I do believe that Ms Purcell can relate to the experiences of the play, undoubtedly: The writer-artist created those experiences with cauterising brilliance. What I am saying, is that at the performance I attended, the life-ownership - her technical ability to personalise all that the play demanded of her as an actor, was not expressed from a courageous organic technique, convincingly. As a result, then, I was not imaginatively swept into a subjective absorption of all that Ms Purcell's The Drover's Wife was going through, as much as I wanted too. I was not, resultantly, able to suspend my disbelief. So, I, simply, had the time to ponder other castings with other actors and I wondered what affect having a younger actor in the role would do. I know that if Ms Purcell had convinced me that what was happening to The Drover's Wife was truer in performance, I would have had a suspension of my disbelief and would have had no time to ponder other possibilities of casting. Age suitability is no deterrent for belief. Lack of a convincing truth is. I wish I had the wherewithal to see Glenda Jackson play King Lear later this year. Neither her age or gender would be a barrier for me - and I would only ponder other castings, remember or imagine, if I was not engaged by the truths of the acting. No, Ms Purcell, according to other responses, has suspended others belief systems, and they have not needed or had time to ponder the casting of the role at all. I was pondering the theatrical affect of this casting or another.